A year ago in Jacksonville, Kirby Smart and the Bulldogs pulverized Florida at the point-of-attack on their way to a dominant 42-7 victory over the Gators that was, for all intents and purposes, over after eight minutes of football. By that point in time, Georgia had a 21-0 lead and 156 yards of offense on its first 8 plays from scrimmage and Jim McElwain was more likely talking to moving companies on his headset than assistant coaches. On the afternoon, Georgia powered its way to 292 yards rushing on only 35 attempts — a staggering average of 8.4 yards-per-carry and a testament to the dominance of Georgia’s 2017 front five and running back stable led by Sony Michel (137 yards on 6 carries!!) and Nick Chubb (77 yards on 13 carries!!). Before Gators fans remind me that Chubb and Michel are gone now, it’s important to also remember that Elijah Holyfield also had a 39-yard touchdown run against Florida (above) and that all told, the Dawgs had eight runs over 10 yards against essentially the same Florida defensive front they’ll play Saturday, save Taven Bryan, who, it bears repeating, was a first-round draft pick at defensive tackle and is precisely the type of interior space-eater the Gators’ line lacks in 2018. Yes, it’s a new season. 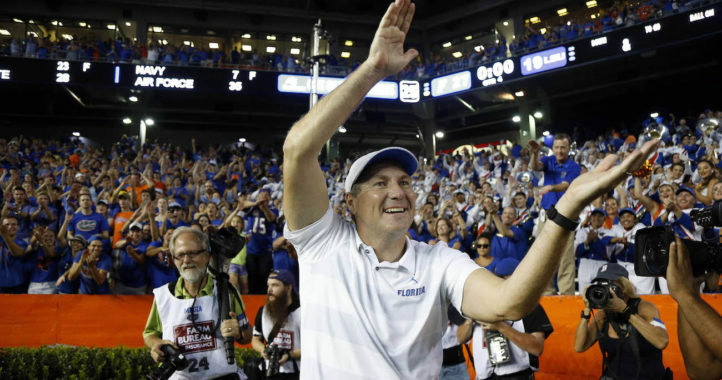 Yes, Florida is a far better football team on the field and off it than it was a year ago, when the off-field distraction of “death threats gate” and McElwain’s imminent departure circled the program like buzzards waiting on a dying animal. None of that is insignificant. Nevertheless, Georgia’s power running game—and Florida’s ability to defense it—will decide Saturday’s Cocktail Party—the most pivotal edition of the annual rivalry on the St. John’s River since at least 2012. The matchup still favors Georgia, although certainly not decisively. Georgia is still a powerful, balanced offense that runs the ball effectively in 2018. The Bulldogs will arrive in Jacksonville ranked 9th nationally in both rushing efficiency offense and 9th nationally overall in rushing offense. Those numbers aren’t quite as dominant as last season’s team, which came two plays from winning the national championship behind the same power running game, but they are similar. To further elucidate Georgia’s explosiveness in the ground game, it’s worth noting that Georgia ranks 13th nationally in explosive running plays (10 yards or more) at a lofty 20.6%, which means just under one-in-five Georgia rushing attempts goes for more than a first down. This is all true despite the anomaly of a paltry 113 yards rushing on only 3.8 yards-per-attempt in their lopsided 36-16 loss to LSU, which means that in all of Georgia’s wins, it has largely been able to run the football at will, just as it did against the Gators last season. Of course, some of this is about who Georgia has played to this point in the season. Excluding FCS foe Austin Peay, Georgia has faced only one defense ranked in the top-40 nationally in both total and S&P+ efficiency defense. That defense? LSU, which is ranked 12th in total defense and 10th in S&P+ and as noted, largely stopped the Dawgs ground game in its tracks. In fairness to Georgia, South Carolina has defended the run capably most the season (39th nationally) and stood little chance against the Dawgs power running game, surrendering a season-high 271 yards on 52 carries and five runs of ten yards or more. But as a whole, Georgia’s offensive line hasn’t been challenged much at the point-of-attack this year, and when they were — against LSU — they wilted. Undoubtedly, Georgia knows this and has a point to prove. Florida’s defense enters the Cocktail Party ranked 31st nationally in total defense and 19th in S&P+ defense, solid numbers that profile the Gators as clearly the second-best statistical defense Georgia has faced this season. The rosy statistical profile suffers from two problems. First, Florida doesn’t tackle well, ranking 11th in the SEC in tackle rate, a big reason Florida was steamrolled at home by Benny Snell Jr. and Kentucky (303 yards rushing on only 41 Wildcats carries. Florida has missed double-digit tackles in multiple football games this season (Kentucky, Mississippi State, Colorado State) and if they do that Saturday at TIAA Bank Field, they’ll leave with a second loss. That is how LSU managed to seize a late lead against Florida — by busting big seam runs after being corralled most the football game; it is also how Benny Snell Jr. and Kentucky salted the Gators away despite a furious Gators comeback. Elijah Holyfield will be the toughest back to bring down Florida has played since Snell, as “The New Deal” rates third in the SEC in yards-gained-after-contact, behind only Snell and Florida’s Jordan Scarlett. The task becomes an even taller order for Florida because Georgia’s center, All-American candidate Lamont Galliard, is brilliant at detecting and calling out the types of run blitzes Todd Grantham specializes in defensively. 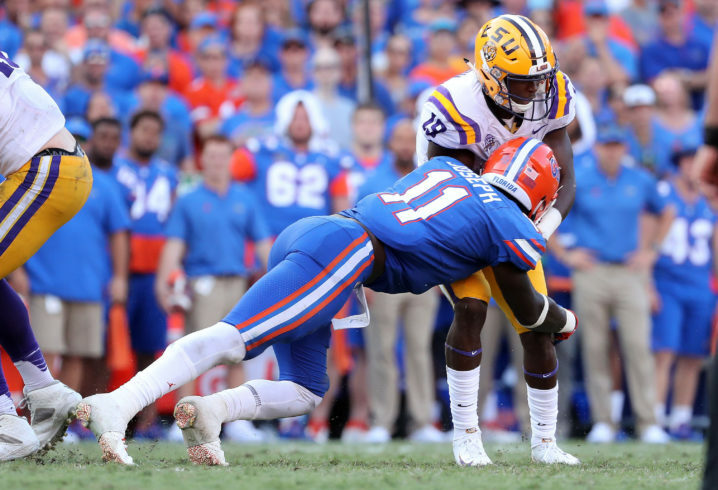 The Gators slowed LSU through a ferocious pass rush and a healthy dose of run blitzes from Vosean Joseph, in particular. Galliard should give Georgia a chance to detect and exploit some of that and Florida will need to be careful to not get caught out and fail to fit a gap. One reason for hope for Florida? Their worst statistical performances against the run this season came prior to the return of All-SEC LB David Reese and senior edge-setter and captain Cece Jefferson. Since those two players returned, the run defense has surrendered only 3.6 yards per-carry, a stingy number considering they’ve faced two of the nation’s better rushing offenses in Mississippi State (16th) and LSU (27th). 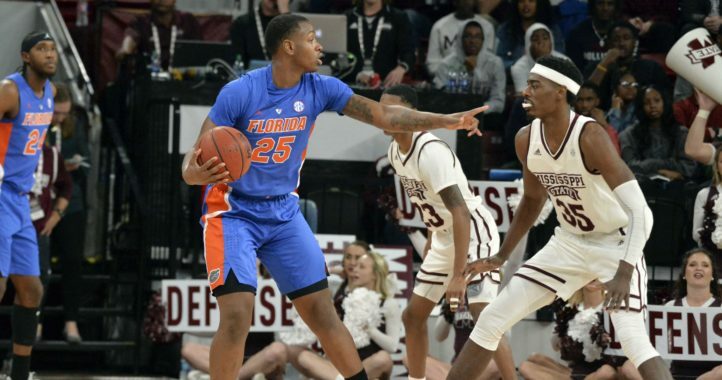 If Florida wants to have a chance Saturday, they’ll need to play to the post Colorado State game standard, not the one that was tossed around at the point of attack against Kentucky. The bigger question is will Georgia use its power run game? The debacle at LSU can be directly contributed to a abandoning a run game that was averaging 8 yards per carry for some unknown reason. Did Chaney learn from his mistake? I think some of that is on Chaney. It also should be noted that Georgia ran on 53 percent of first downs against LSU and had minimal success (under 30 percent success rate). So the argument “they abandoned the run” is true to an extent, but also somewhat about LSU putting Georgia in bad spots on 2nd down. Fromm goes to the line for each snap with a pass play and run play given to him by Chaney. He checks into one depending on pre-snap reads. The heavy-dose of pass plays against LSU was on account of the defensive looks LSU was giving Fromm pre-snap and forcing him into checking into passing plays. Chaney, alone, does not bare full responsibility. The responsible evaluation is that LSU was just the better team on that day and throughly mashed Georgia. Chaney, Smart, or President Lincoln could have done nothing about it. They may do the same thing to Alabama and they do, I will acknowledge it and move on. I wish you would. ^^ what he said. LSU got whipped by FL. Do you see LSU fans complaining? Move on, its getting annoying! LSU in no way “got whipped” by Florida. Try taking off the orange and blue glasses and re-watch that game. Don’t need to, FL’s defense put it on LSU…not sure how you define 2 2 interceptions 1 fumble recovery and 5 QB sacks for loss. Besides the point, when you lose a game…move on. Its annoying after two weeks of excuses. What on earth are you talking about? Where have I given excuses or overly-lamented the loss? Also, when you’re up by a point with less than 4 minutes left in the 4th quarter, it’s extremely hard to say you whipped anyone. But nice try. Pretty sure everyone other then you understands what I typed. So essentially this entire article can be summed up as, UGA has only played one good defense and got beat. UF’s run defense was bad with 2 of it’s key players out, but has been very good since their return. You can throw all that stuff out come Saturday. Anything can (and will) happen at the WLOCP!! Go Gators!! 2 best teams in the East. I’ll definitely be peaking at this one. UGA will play to it’s strength which is the run and UF isn’t that good against the run. The pass defense is top 10 though, so if they can slow the rush they will have a good chance at staying close. UF offense has to get it going, they are terrible run and pass. I expect a lot closer game this year. Hopefully a goody. I guess the big question is whether or not Florida’s young secondary can adequately defend the pass while being shorthanded due to a larger concentration on the run. I agree with your observation, however, if Florida can bring pressure, Fromm cannot pass to win. Fields may be a different story. Fromm has shown he can pass to win, you just need to look at the body of evidence beyond the LSU game. And Florida’s secondary should not be confused, at all, with LSU’s. Are you naive to think the FL secondary is “not be confused” to LSU? You need to check stats before you type, just saying. Florida’s secondary stats are padded in part by Florida’s strong pass rush. Georgia was the same way the final two years of Richt’s tenure. When you pressure the QB often, it statistically makes your secondary look better than they actually are. Naming players from the last 3-4 years that went on to the NFL. CB/safeties Vernon Hargreaves, Joe Hayden, Keanu Neal, Reggie Nelson, Brian Poole, & Jaylen Watkins. Not including the current ones that will be going. You don’t “pad” great players. So my point being FL has and has had backs that are great in the secondary. I don’t think anyone here doubted the history of Florida’s secondary. My only point is that this year Florida’s secondary is young and is being protected to an extent by a strong pass rush. Fromm not only passed to win, but carved up DBU. Hey Gotcha, looks like Florida’s secondary really shouldn’t be confused with LSU’s. Fromm completed 71% of passes for 240 yards, 3 TDs, and 0 Ints. Wait what? Florida is bad at running the ball since when?? We are averaging just shy of 200 yards rushing a game, and 5.1 yards a carry. We also have 3 very good backs, and honestly a fourth very good and under used back in Toney. Our passing game can be weak though. We have the receivers but Franks makes piss poor decisions half the time. Other times he looks like a capable qb with a big arm. If only he would learn how to focus, not throw boneheaded picks in the end zone, and miss wide open receivers…but you never know because in a rivalry game he might just be locked in and be a competent qb and take advantage of our good receivers. Either way we do have a very good running game. Not the best in the country but certainly nowhere near bad! Hoping this will be Franks break out game. GO GATORS! Franks look pitiful against UGA. Not quite a breakout game, huh?